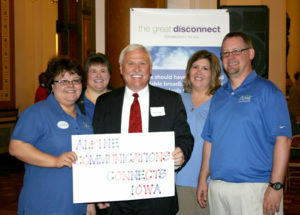 Learn why Iowans everywhere need a connected world. Hundreds of representatives from Iowa independent telecommunications companies rallied at the Iowa State Capitol on April 20th. Our goal was to raise awareness about our telecommunications infrastructure and keep the public informed on connectivity issues that directly impact the state. We believe in our state, where it has been and where it is going. Between the proposed National Broadband Plan and other policies, Iowa is at risk of losing its robust connectivity. Instead of continually maintaining and updating connection speeds, Iowa may be left behind as the rest of the nation moves on to connections speeds 25 times the rate of Iowa’s connection speed. Are you ready to let that happen? Here’s how you can help. Please call or write to your legislator, send press releases and editorials to your local newspaper and tell those around you about the potential ramifications of this legislation. Together, we can raise awareness on this issue. To find materials to help you spread the word, visit www.TheGreatDisconnect.org or call Alpine at 245-4000.